We will begin our Winter Training program this Tues Jan 15. These sessions will run every second week through March (except for March Break). We will continue to update the technical instruction pages with quality information to help players develop their skills. Currently you can find information on Hitting, Pitching and Throwing. This information is the basis of the technical training provided by AMSA. We strongly encourage parents to take an active role in helping players to practice their skills at home. Ayr Minor Softball follows the Softball Canada Long Term Player Development Program. In order to help our players (and parents) better understand how they can develop in the sport we have road maps showing the levels of play available in the association this year. Further maps will detail competition outside of AMSA. 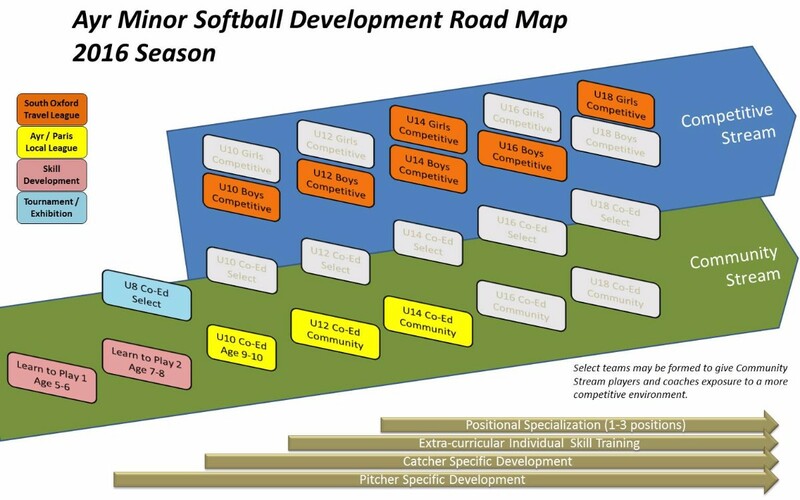 For more information on how Softball Ontario plans to develop and grow the sport over the current 3 year period.